One year. Twelve months. Three hundred sixty five days. As I’ve aged, time tends to fly by faster. As a military wife during a deployment, in many ways this has seemed like the slowest year of my life. Yet here I stand at the dawning of the end with the realization that in some ways, the past year didn’t drag quite as much as I thought. Looking back on this deployment I find myself remembering some not so proud moments. There were times I was angry and perhaps a tad bitter and had a downright bad attitude…I remember telling myself “this stinks”. I remember trying to deposit the hail insurance check written in my husband’s name early on in the deployment…trying to explain I had power of attorney and he was in Afghanistan as I then broke down in tears…it was Aug. 6, 2011, the day the Chinook helicopter went down in eastern Afghanistan and my heart was broken for the families being informed back home. I remember the kindness of the ladies at the bank as I walked out, swallowed my pride composing myself, and walked back in. I remember having no sense of joy as God allowed several trials into my life in a very short period of time…and while I had specifically prayed in a way for them, and while God answered that prayer in ways I never imagined possible nor ways I honestly wanted, the pain of the emotional struggle dealing with those trials with a husband half a globe away seemed overbearing at times. Yet through it all, as I prayed for joy in the midst of them, God allowed me to find joy. He gave me His strength, peace, comfort. He helped me to heal and He taught me much in the process. I can’t imagine going through a deployment or anything in life without God! He truly is my “refuge and strength, an ever present help in time of trouble”. As I’ve listened to my husband’s stories and viewed pictures and videos of his missions, my eyes have been opened even more how much I daily take for granted. This deployment has once again reminded me how much I take my spouse for granted as well. When he returns, I want to “live everyday like he’s leaving tomorrow” as this military blog post so beautifully points out. I don’t want to take the day to day things for granted and God has also taught me much about being the wife He wants me to be through this. I have a sticker on my truck that my husband gave me before he left. 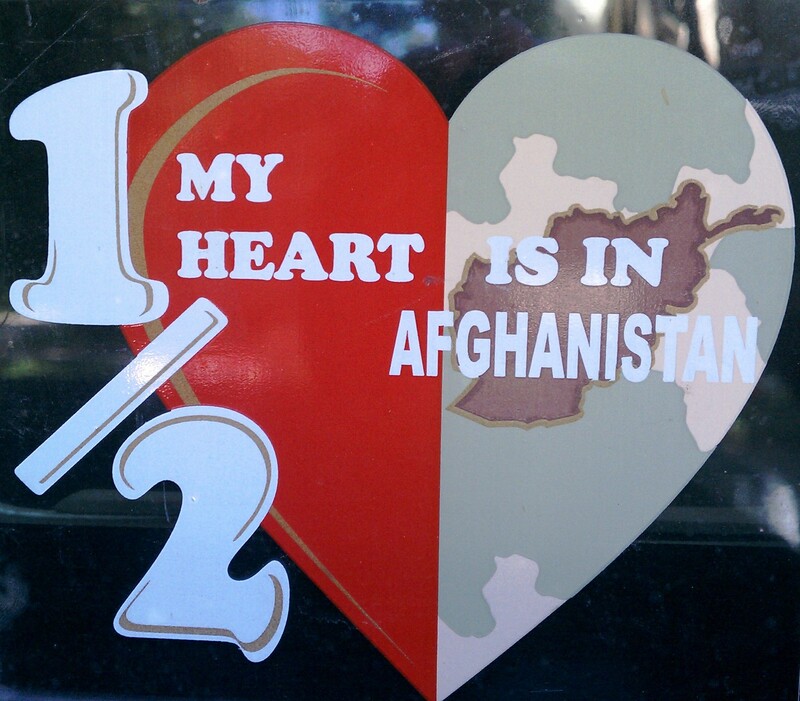 It says, “1/2 of my heart is in Afghanistan”. I’ve had several people tell me they tear up when they see my truck and that sticker. The saying is true even though I’m complete in Christ. I can’t say it hurt quite as much when he first deployed-probably because I was more mentally prepared then-but after coming home for two week leave and leaving again, I truly felt like my heart had been ripped in half. I’m looking forward to the day when I can remove the sticker but keep it in a place I will always see it to remind me…to remind me of what it was like…to remind me to continually pray for our military and their families back here. I’m looking forward to the day that my whole heart is back at home with me in the U.S.A.! Posted on May 28, 2012, in Military, Reflections and tagged ADT, Afghanistan, Agribusiness Development Teams, Air Force, Army, deployment, home coming, Memorial Day, Military, National Guard, Nebraska, Reflections. Bookmark the permalink. 8 Comments. Thanks for the comment Dave, for your service, and for your friendship towards Chris and me! I’ve enjoyed getting to know Felicia better and am looking forward to several of us hanging out as couples in the future! I am so glad you shared it mainly because it helped me to find you. I loved this post, to hear the struggle and the strength and the making it through. The commitment. It was wonderful to read. Safety to your soldier and strength to you. Thanks Megan! I love your blog and really appreciate your posts! Thanks for always sharing your heart and the life of a military wife! I just came back from the airport, I left my husband he is going to Afghanistan! I feel sad 😢 like all I want to is sleep!! This is his 3 time!! I’m really hopeless!! He is not going to be on his birthday either on Christmas! That is killing me! !